The Ridgewalk. Notice the work the beavers have done on the tree with the blue Rideau trail sign. This trail sometimes moves through thicker hardwood forest, so the grassy trail here might be a bit deceptive. However, the variety is what makes this a stellar walk. The Gould lake Conservation Area is north of Kingston in Eastern Ontario and just north of Sydenham. It's south of Frontenac Provincial Park. Click on the link above for maps and more detailed directions. The area sports 589 hectares (1,455 acres) of wilderness. Entrance fees are $5.50 for adults, and $3.00 for children, with a maximum of $14 per car (as of 2013). The trails in the Gould Lake Conservation Area are maintained mostly by the Rideau Trail Association. The trails are some of the finest you'll find anywhere. They can be a challenge; they're not a Sunday stroll. The area is on the southern fringe of the Canadian Shield and the park features a number of beautiful high ridges overlooking Gould Lake. Trails often climb a steep ridge, follow it for a while then drop down into a marshy area or to the water's edge. Old mica mines next to some trails add a unique touch. What is today the park was a centre for mica mining in the second half of the nineteenth century. 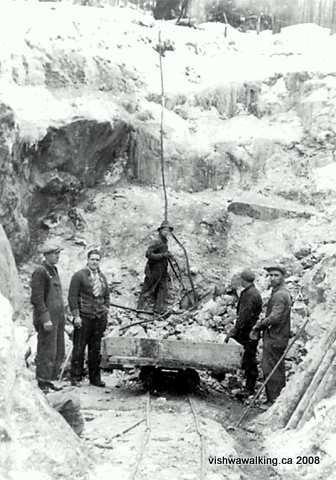 The MacClatchey mine, which was situated between Gould and Blue Lakes (near the Mica Loop), was mined first for phosphate and then for mica. It was abandoned in 1912 because water had seeped from the lake into the mine. "The main shaft was over 100 feet deep, and opened out to a chamber 8 feet by 30 feet. On the property were a boarding house, trimming-shed, stable, forge, and other buildings. No power machinery was used, and hoisting from the pits was done by a horse-derrick and whims" (From a Cataraqui Region Conservation Authority website page). Look for bits of mica on the pathways near the mine holes. Phosphate and mica: what are they? Phosphate is an inorganic chemical. " In 2007, at the current rate of consumption, the supply of phosphorus was estimated to run out in 345 years. However, scientists are now claiming that a 'Peak Phosphorus' will occur in 30 years and that 'At current rates, reserves will be depleted in the next 50 to 100 years'" (quoted in a Wikipedia piece, which has references for the information quoted. See the Mobjectivist for a fascinating and more detailed analysis of how much phosphorous we have left in this world). Mica is found in rock and "sheet" form. You'll see both around Gould Lake. Mica has excellent chemical stability and is resistant to heat. It is used in electrical application and as an insulator.it can be pressed into sheets. It is also used in such products as toothpaste and cosmetics . Apparently India has the largest deposits of mica in the world..
at this picture, perhaps some of the gullys I walked through were once mines. Between 1967 and 1972, the Cataraqui Region Conservation Authority (CRCA) bought land from what was then Loughborough Township and from private landowners to make up what the park is today. The CRCA is now vamping up entrance to the park. It's now (in 2013) $5.50 per person to get in, $3 for children 12 and under, with a maximum of $14.00 per vehicle. There are back entrances to the park from the trails that enter/exit on Bedford Road. Parking inside the park is on the right at the end of the road just before you get to the "barn." The barn is on the right as you walk across an open field down to the little beach. The field is a great place to spend a summer day hanging out. Park visitors bring barbecues and there's usually a few kids playing in the water by the beach, which has a nice bit of sand mixed, with that good old squishy lake mud as you get a bit into the water. There's a little ring of rope with floaters on it defining the swimming area for kids. The lake bottom drops off relatively quickly, so plan accordingly if you have kids. In the winter, there are often school groups using the park and in the summer, day camps operate for kids of various ages. There are a few picnic tables in the field, some barbecue spots and a fire pit. Although there are a few trees on the periphery of the lawn of the field, there are not a lot, so you may want to bring some sun protection. Outhouses are at the western edge of the field. There may be running water in the barn, but I noticed no access to drinking water. You can call the CRCA office at (613) 546-4228 ext. 222 for more information. Once you are on the trails, there is not much in the way of beaches (the Rideau Trail guidebook mentions a beach on the Tom Dixon Trail, but it's small and not really a good stopping place), but there are plenty of fine rock outcrops where you can swim. These will give you more privacy, of course, and you have the joy of picking your very own spot. Concerning numbering of the trails, I've follow the Cataraqui Region Conservation Authority (CRCA) brochure, which you can get when you enter the park.. The Ridgewalk and the Mine Loop are direct offshoots of the Rideau trail, so if you want to walk them you should check out my description of this section in the link above. Total: 2.7 kilometres.The loop only is 2.1 kilometres, but I've included the connecting bit (the brochure number "3. Crossover" which equals 300 metres) and the 280-metre "4. Point Spur"). From the main park area (the "barn") head up the Rideau Trail to Frog Junction just after the bridge at the Marion Webb Boardwalk. Turn right at the junction and follow the Rideau Trail's blue triangles. The trail leads up the hill and slightly away from the water, then settles down through some great open hardwood forest to following the water's edge. It passes the crossover junction (400 metres in), then rises to give you a fine view of the lake on a ridge at the 800 metre point. The trail meets the Point Spur (1.1 kilometres) and heads to the left of the latter. However, the Point spur is worth investigating. You'll get some excellent views of the lake all along the Point Spur. On the way back, you'll run into a couple of mica mines. One is particularly large and is fenced off. At one point the trail opens somewhat as it follows an old mine road. At the 2-kilometre point, it meets the other end of the crossover trail, then moves on to Hill Junction, back at the main Rideau Trail. Total: 1.8 kilometres (the brochure calls it at 1.4, kilometres, the Rideau Trail lists it at 1.8). This trail branches off the Rideau Trail at Brook Junction, 1.7 kilometres from Frog Junction. You can use it as either an alternative to the main trail or as a loop if you are doing a day trip from the Gould lake parking lot or coming south from Bedford Road. The trail runs along the ridge to the west of Gould Lake. Watch closely for trail markers in places as the trail winds along. The trail rises from Brook Junction to a grassy ridge, then drops to skirt a marsh on the left . It rises again to the ridge and nearing the northern junction with the trail drops once more to negotiate a little creek. are more like ponds or little lakes. You can get to this trail from the back of the park's parking lot. If you want to do it west to east from Bedford road, the trail heads east from the road between Shultz Lane to the south and McKercher Lane just to the north. From the junction of Freeman Road and Bedford Road, it is 3.8 kilometres north. You can park by the roadside. It was once used for the mica mine operations in the area. This is a good easy trail which might work for families with different walking skills. It's also open enough for cross-country skiing. I have walked it in both the summer and the winter. At the bridge, have a look at what might be a boiler supporting the bridge itself. One website mentioned a boiler somewhere beside the Mica Trail. I never saw it (and I was looking). However, perhaps this is the boiler referred to. The creek flows from Gould Lake into a couple of smaller lakes before emptying into Little Long Lake to the east. This is the same creek as the one that flows under the Tom Dixon Trail bridge (see photos and description below). From the bridge it's an easy 1.6 kilometres to the road, passing the aforementioned Porky Junction along the way. If you drive Bedford Road, as you pass Little Long Lake (on your right as you head north), notice the little creek that passes under the road on its way to the lake. It's the same creek you walked over on the Wagon Trail and the Tom Dixon Trail. That's what I love about this walking gig: it's like putting the pieces of a jigsaw together, getting to understand the geography of the world we live in. This is a fantastic trail, but be warned: it traverses steep ridges and will give you a good workout. Tackle it only if you are confident of your hiking skills. It follows the eastern edge of Gould Lake. I have counted a bit of trail that starts on the south side of the Miriam Webb boardwalk/bridge and follows the edge of Gould Lake to the main picnic area. If you start there, you come out at the beach near the canoe storage area. You'll pass the cement foundations of an old building just before you reach the beach area. The trail then follows a little boardwalk on the opposite side of the beach below the barn. As it curves northward, following the shore, you'll soon get a taste of the steep ridges. At just over a kilometre from the barn, you'll come upon an open spot with a trail heading east away from the lake. That's a short connecting bit that rejoins the Tom Dixon Trail, cutting off the point loop. Another trail heads south and is a connecting link to the Wagon Trail. It meets the latter at a bridge with an old metal boiler supporting it (see the Wagon trail description). Continuing along the lakeshore, the trail loops up and around the point, arriving at a little bridge (see pictures below). The connecting link described above comes in from your right. Cross the bridge and continue your northward trek. At the 2-kilometre point from the barn, there is a second short crossover trail that leads you east to Porky Junction and the Wagon Trail. "Note a stand of mature large-tooth aspen adjacent to a mica pit," says the 2006 guide book (p. 34). I didn't read the Rideau Trail guidebook before I walked the trail and missed both. At points here, you'll be walking high on a ridge overlooking the lake. This is, as a glance at the map will show, is actually a little bay or harbour with two spits of land protecting it. Two views of the bridge on the Tom Dixon Trail in different seasons. As you near the northern part of the "harbour" (about 2.5 kilometres from the barn), you'll see an "unofficial" trail crossover dropping sharply off the cliff. You can take this if you want to cut out a more relaxed and safer little loop that eases you down the slope. Be careful if you take this option. Just past this point, the trail passes by a great open spot with just enough trees to protect you from the sun, open enough for a little breeze and some big flat rocks to relax and have a picnic. When I walked this bit in July, some summer camp folk had stopped here and were playing games. They had paddled in. The trail curves right at this point and continues to follow the water's edge. Members of a summer camp play a game at a stop along the Tom Dixon Trail. At 2.7 kilometres from the barn, the trail meets the southern junction of the Mica Trail. It then goes through an impressive gully for short distance before the Tom Dixon Trail ends at Mica Junction. The Mica Trail heads west up an incline and the East Trail heads west up a steeper hill. I have walked parts of this trail in the winter, but it would be very difficult walk the entire trail at this time of the year. Fortunately in deep winter, there is the flat ice of the lake to fall back on. In winter I have walked a mix of these trails, including a semi-bushwhacking trek along a trail cut by some high school students. On a sunny day, when exhaustion slows you down, a walk down the lake can be exhilarating. You may want snowshoes, although I plodded along in my boots. This is a fine trail, which you could regard as an extension of the Tom Dixon Trail, following the lakeshore for most of its length. I didn't see any mica mine holes such as there are on the mine loop on the opposite side of the lake. As I mentioned elsewhere, perhaps the mines were larger and I actually walked through human-made gullies. The MacClatchey mine was here, between Blue and Gould lakes (see introduction above). There must be some trace of the mine in the bush as there were once a number of buildings associated with the mine. There are some absolutely spectacular views of Gould Lake along sections of the trail where it borders the western shore. The northern point is a good place to stop for a rest and a picnic. As you come down to the southern point that forms the northern side of a narrows that join a bay to the east and the main lake, there is a more open grassy section. Turtles obviously love it here, as I found several holes ("nests"?) where turtles had broken from their shells and made for the water. East trail has been truncated from its earlier longer version that extended to Bedford Road, probably because of private property issues. There are hints on Bedford Road as to where the old trail came out and private property signs nearby. Trail makers are so at the mercy of private property owners, largely because our culture, from its beginnings, has been built upon the theft of land from those who know it can't really be so individually owned. I try to balance that with the many generous landowners who are more civilized in their approach to the land they oversee. As it stands today, the trail starts at the northern junction of the Mica Loop and the Tom Dixon Trail. It winds up and down, passing by the end of Famous Trail less than 200 metres along, then looping by Blue Lake (on the left) and a marsh, crossing Stinky Creek before it cuts sharply right, then meets and ends at Famous Trail. As it's so short, it's best combined to make loops with Famous Trail and the Tom Dixon Trail. It's got some good rugged bits. I saw a huge buck along this trail, which I disturbed as he was drinking from one of the marshes. Famous trail meets Bedford Road 4.6 kilometres north of the junction of Freeman and Bedford roads. You'll be in a little valley with cottages on Cronk Lake on the right, and a clearing with a trailer and other mechanical bits and pieces on the left. I parked in the clearing, although it may be private land. There's a little boardwalk by the road that gets you over the ditch, followed by a steep incline. The trail winds about avoiding marshy areas. There are also a lot of steep ups and downs to negotiate. At the 600-metre point, the East Trail comes in from the right. A bit farther on, it crosses what the guidebook calls Stinky Creek. The trail then winds on a bit farther, ending where it meets East Trail once more as the trail opens to a grassy spot.